Pompeo says he doesn’t know the exact timing. Speaking in Seoul, he says he expects it to happen fairly quickly after he and the North Koreans return to their nations. Pompeo returns late Thursday to the U.S. He says much more work has been done by the U.S. and North Korean that couldn’t be encapsulated in the Trump-Kim Jong Un statement. So he says teams will now work to make more progress on those items. Pompeo is laying out an ambitious timeline for denuclearization following President Donald Trump’s meeting with Kim Jong Un. He says he won’t disclose specific timelines but that the administration is hopeful that “major, major disarmament” steps can occur before the end of Trump’s first term. The term ends in January 2021. Secretary of State Mike Pompeo says that North Korean leader Kim Jong Un understands that “there will be in-depth verification” of nuclear commitments in any deal with the U.S.
Pompeo is in South Korea a day after President Donald Trump met with Kim Jong Un and announced the U.S. would freeze what he called “war games” with North Korea. Pompeo says Trump was “unambiguous” in conveying that to Kim. House Speaker Paul Ryan says President Donald Trump should be “applauded” for his meeting with North Korea leader Kim Jong Un. But Ryan is cautioning on Wednesday that the next steps toward an agreement won’t go fast. Trump and Kim signed a joint statement that contained a repeat of past promises to work toward a denuclearized Korean Peninsula, but the details haven’t been nailed down. Trump has been tweeting about his talks with Kim since Air Force One returned to the United States early Wednesday morning, arguing that the talks with North Korea have made the U.S. safer. Trump’s claim is dubious considering Pyongyang’s significant weapons arsenal. Back in the United States, Trump is tweeting about his historic summit with North Korean leader Kim Jong Un. He says there is no longer a nuclear threat from North Korea even though experts estimate that Kim’s government has enough fissile material for 20 to 60 bombs. President Donald Trump says on Twitter, “There is no longer a Nuclear Threat from North Korea,” as he returns to the United States after his historic summit with North Korea leader Kim Jong Un. He says before he took office, “people were assuming that we were going to War with North Korea,” and President Barack Obama said North Korea was the nation’s biggest problem. 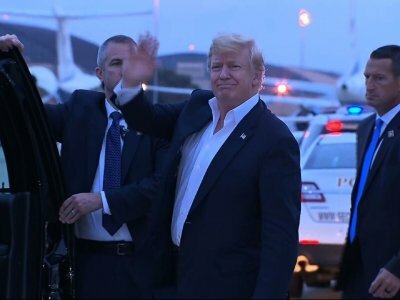 President Donald Trump has arrived back in Washington from his historic nuclear summit with North Korea’s Kim Jong Un in Singapore. Air Force One touched down at Joint Base Andrews early Wednesday morning, completing the president’s marathon trip to Asia for talks with the North Korean leader. The president made refueling stops in Guam and Hawaii on his return to Washington. U.S. Secretary of State Mike Pompeo has landed at Osan Air Base south of Seoul ahead of meetings with America’s allies in the aftermath of the summit between President Donald Trump and North Korean leader Kim Jong Un. He’s expected to meet privately in the evening with Gen. Vincent Brooks, commander of U.S. Forces Korea. Peskov adds, however, that given how complicated the situation is around North Korea, the Kremlin isn’t expecting a quick resolution. A spokesman of South Korean President Moon Jae-in says Washington and Seoul need to consider a “variety of ways to further facilitate dialogue” while they are engaged in nuclear negotiations with Pyongyang. Kim, Moon’s spokesman, says Seoul is still trying to figure out the exact meaning and intent of Trump’s comments. The U.S. top diplomat is jetting to South Korea to brief the country’s president as Asian allies try to parse the implications of the extraordinary nuclear summit in Singapore between President Donald Trump and North Korea’s Kim Jong Un. South Korea’s presidential office says U.S. Secretary of State Mike Pompeo will meet President Moon Jae-in Thursday morning to discuss the meeting, which made history as the first between sitting leaders of the U.S. and North Korea.